Takoyaki, which is often humorously (and unfortunately) translated as “octopus balls,” are dumplings made of batter, picked ginger, tenkasu, and green onion, with octopus meat in the middle and sauce, aonori, mayonnaise, and bonito flakes sprinkled over the top. Now, as a non-Japanese, and I know that octopus can sound quite unappetizing at first, but these little snacks are so good that you’ll find yourself popping them into your mouth one after another. These can often be found at stalls at festivals and anytime on the streets, in restaurants, and even in people’s homes (you know you are an Osakan if you have a takoyaki cooker in your home). Furthermore, almost anything can be substituted for octopus when you make it on your own, including squid, kimchee, cheese, vegetables, or whatever else you can think of. 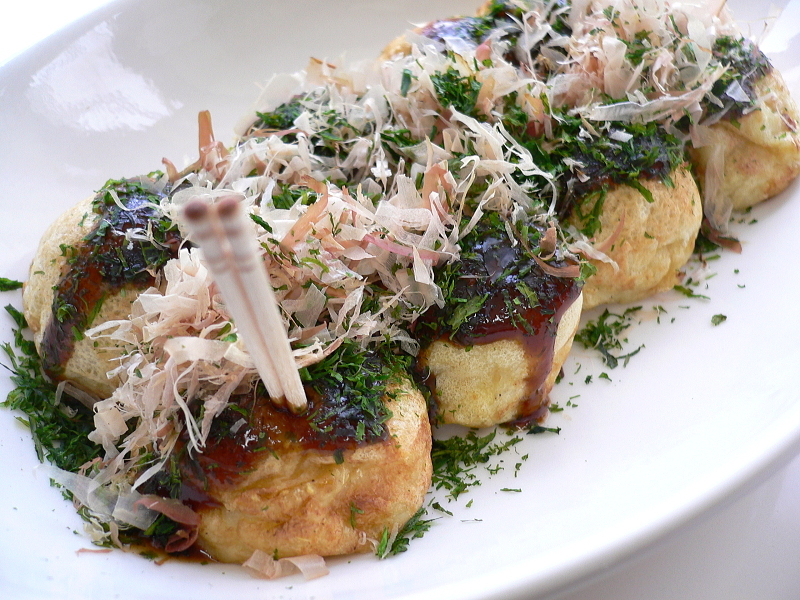 Along with okonomiyaki, takoyaki is one of the representative foods of Osaka’s food culture, and apparently this incredibly popular dish has even made its way over to a few restaurants in the United States in recent years. I personally recommend Takoyaki Doraku Wanaka (たこ焼き道楽　わなか　千日前本店), a restaurant opened in 1961 on Sennichimae in Namba (easy to get to from Namba or Nipponbashi station). It is actually right next to NGK, the famous comedians’ theatre, and television and comedy stars are sometimes known to drop in for a bite to eat. It costs 400 yen for 8 dumplings, and it is open from morning until 11:45 pm.